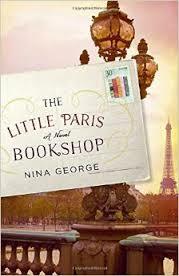 a book chick: "The Little Paris Bookshop"
my take: This book is a bit of an enigma. I really wanted to love this. Bookstore, Paris. What more could you want?! A believable story? Which I get: it's fiction. There are times when I'm willing to suspend reason and logic and just go where the author wants to take me. And there are times when I bump my nose against the mirrors in the smoke-filled illusion. I didn't love the idea that someone could prescribe a novel to cure you - that the main character could diagnose what ails you and treat it with fiction. Also, I found the love triangle a bit hard to swallow. What I did love is the description of the French country-side as the bookstore travels downriver from Paris. It made me want to travel to France. Again. Now. my source: Daughter Anne received to review; hers won't be a glowing report, either. my verdict: Semi-good feel good. Good thing it was a free copy is all I have to say.